PARKERSBURG, W.Va. (Sept. 10, 2018) – Once known as the “Island of Eden,” Blennerhassett Island Historical Park continues to be shrouded in mystery and romance after 200 years. 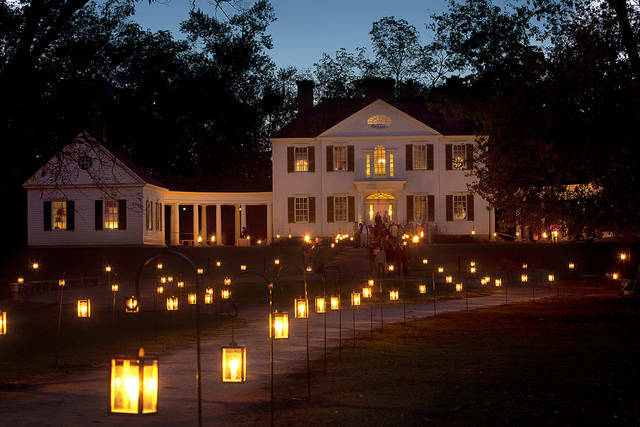 This autumn the park will once again be transformed into a flame-lit world of the 18th-century when electricity is banished for the annual Mansion by Candlelight event on Oct. 12 and 13. Guests are transported back to the year 1805 where Harman and Margaret Blennerhassett are hosting a lavish party complete with mansion tours, horse-drawn wagon rides, period games and dancing, a harvest supper, and the servant’s party. Authentic sternwheeler rides ferry guests to and from the island’s reverie. In 1805, the Blennerhassetts allowed their estate to become headquarters for Aaron Burr’s military expedition to the Southwest, an episode that raised the island to national renown and awarded it a permanent footnote in American history. The Burr conspiracy, which is suspected to have involved a treasonous plot to create a new country independent of the United States, has become the subject of many stories, poems, artwork and Broadway shows. The Blennerhassetts fled the island when Burr’s scheme collapsed, but the mansion and history remain.